It is now a Home Depot/Mobile home park. It was also known as Bob's Picnic Park. Chief Pontiac Speedway, aka Lake Angelus Speedway, is East of Pontiac off Lake Angelus Road. In the 50's, my dad, Rusty Kelley, raced at both tracks and many others in Southern Michigan and Ohio, and I have his scrapbook with tons of photos. I did some more research and found a 3/10ths dirt relic on historicaerials. com on the southside of Lake Angelus Rd in a 1964 aerial. I also found the site for the published aerial you have. That track sat behind what appears to be mini warehouses. The backstrech followed Highland Terrace up to Grandview Terrace where turn 3 arced thru the middle of the block. Turn 4 exited at the corner of Grandview and Village Drive. Frontstrech continued down Village to the last left and the turn arced thru the front of the house trailers on the southside. Gos to show Alan Brown made a few errors in his book. Curious, I ran across some info for CPS aka Lake Angeles Speedway, on Lake Angeles Rd. 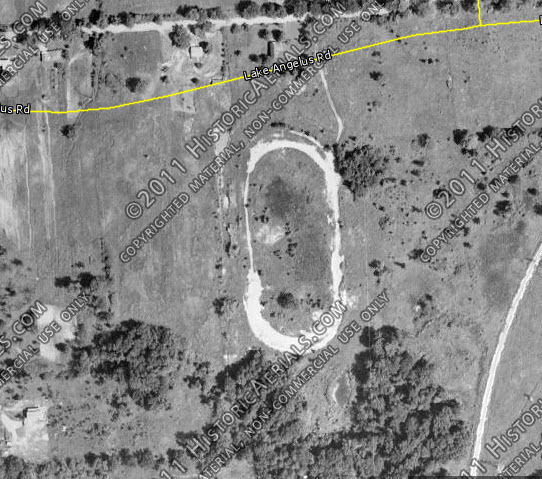 3/8 mile dirt oval ran 1948-55, 57. Also 3/8 m paved ran 1955-57. Any ideas?. this looks like the same track as M59. Ten miles west of downtown would put it at the Home Depot, exactly where the M 59 track, 3 miles past the airport would be. I think these are probably the same track. My Dad used to race here back in the 50s, I have pictures of Car #76, seems the pictures I have are only of the crashes he was in. There were four men on the crew, a real team effort and alot of fun. Chief Pontiac Speedway was located on M-59, near Fisk Road in White Lake Township (about 10 miles west of downtown Pontiac). A mobile home park now occupies the property.